Treat your little bear to a unique and stylish woolly jumper! 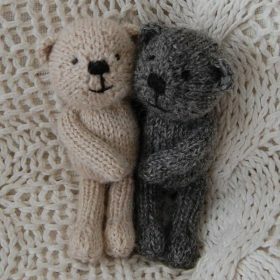 Tanya’s collection of beautifully hand knitted teddy bear jumpers will keep your bear snug, warm and looking very smart. The jumpers, all beautifully hand knitted, range in size to fit all types of bear. From small bears measuring just 5.5″ to 6.5″ and larger bears 7.5″ to 10″. The sizes do depend on the build of your bear so if you would like the exact jumper measurements, for a perfect fit, please do contact us. Tanya’s woolly jumpers look great on all types of bear including our knitted bears and rabbits. Don’t forget antique and vintage teds look great in them too!